It’s 5 a.m. on the Friday before the first home game of the year in Oxford. Long before the 10-acre patch of tailgating Valhalla is engulfed in a sea of reds and blues, of trampling feet and candelabras, of fans and foes all the same, the Grove is quiet. Half a mile away, however, tucked behind Vaught-Hemingway Stadium, the men and women of the Ole Miss landscaping crew prepare. Crew members load trucks and rev engines as they dart about the landscaping home base with methodical zeal. They toss around pleasantries like paper balls into a trash-bin basketball hoop. The sun is hours from rising, but joviality knows no clock around the landscaping department. The crew is part of a close-knit landscaping department that has just 33 employees: 25 in the field and eight on the administrative team. Together they manage 1,000 acres, consisting of a campus regularly recognized as one of the nation’s most beautiful, the Ole Miss Golf Course and the University-Oxford Airport. Tenured member of the Ole Miss landscaping staff Neil McIntosh prepares for a project on campus in 2017. The crew is short-staffed, supervisors say, considering the amount of acreage, shrubs and turf it’s responsible for. And for seven weekends in the fall, as the campus prepares to host tens of thousands of SEC football fans, the landscaping department is put into overdrive. “On home game weekends, we suspend all of our normal activities, and everything is put into game day set up,” landscape superintendent Denise Hill said. Hill, who runs the department’s day-to-day operations, was hired in 2000 to operate a weed eater. Now, she is second in command. She speaks of “trying to make the campus more friendly,” and she does so often, in between short bursts of laughter. She has that affectionate disposition that young employees yearn for in a superior. She rose in the ranks under director Jeff McManus, who was recruited to campus to transform the department a few months after Hill arrived. McManus, who had previously worked at five-star resorts in Miami and Orlando, was recruited by former Chancellor Robert Khayat to “turn Ole Miss into a five-star campus … with only a one-star budget,” McManus said. Instead of cleaning house, McManus focused on working with existing employees and helping them develop. McManus emphasized working “smarter, not harder.” Everything the crews do is calculated, from laying pine straw under the Grove picnic tables to save time mowing to requesting that signs and telephone posts be positioned in flower beds to minimize the manpower spent tending to them. But preparing campus and the Grove to host visitors isn’t just a football endeavor — it’s the university’s main canvas for recruiting, as well. “Sixty-two percent of prospective students decide in the first few minutes if they’re coming to campus, based on appearance … we’re not really cutting grass — we’re recruiting,” McManus said. He has emphatically described his crew’s game day preparation as art, and while Hill agreed, she said it’s more like “sand art,” as it’s scaled to perfection each Friday and blown away by tides of fans on Saturday. On the ground, it’s still dark, and the crew’s mood is playful. These guys are friends — arms wrapped around each other, laughing and teasing as they restore the Grove’s splendor and prepare the grounds to host tens of thousands. 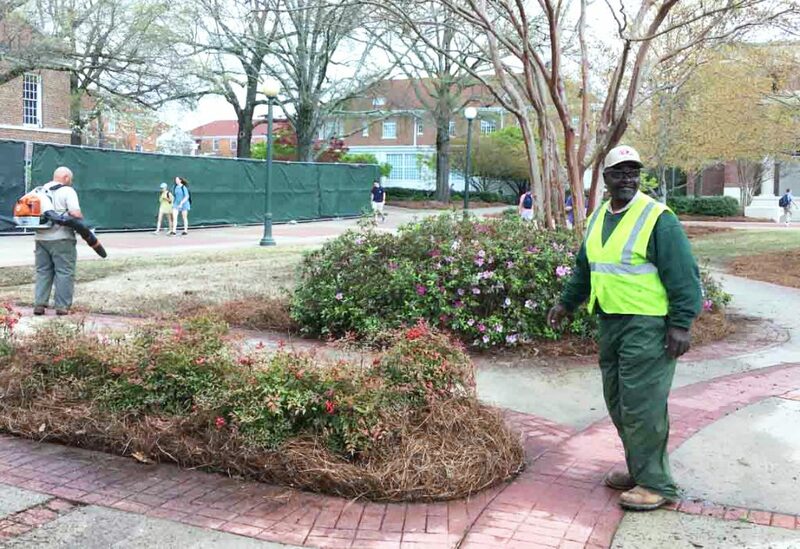 Standing at the corner of University Avenue and All American Drive is landscaping supervisor Sam Johnson. Johnson is the game day morning gatekeeper, and from 3 a.m. until roughly 9 a.m., his word is sacrosanct. He ushers in the equipment vehicles and turns away diligent students looking to hit the books early on a Friday morning — only to preserve their safety, of course. “To me, it’s more than a job,” Johnson said. Johnson predates both Hill and McManus, having served in the landscape department for over 22 years. He’s also a lifelong Oxonian and a faithful adherent to McManus’ leadership strategy, employing it in his own team. Despite serving as supervisor, Johnson doesn’t hesitate to slip on gloves and weed eat, hedge or mow with his team. “We don’t have to micromanage people because we have faith (in) and trust in our employees,” Johnson said. Two hundred yards down from Johnson’s watchful post is where the magic happens. There lie the vaunted Grove trash cans, known around the department as Dixie Cups because they’re red and blue and they stack. Setting up these cans — all 2,353 of them — consumes most of the staff’s manpower. From 3 a.m. onward, it’s all hands on deck. 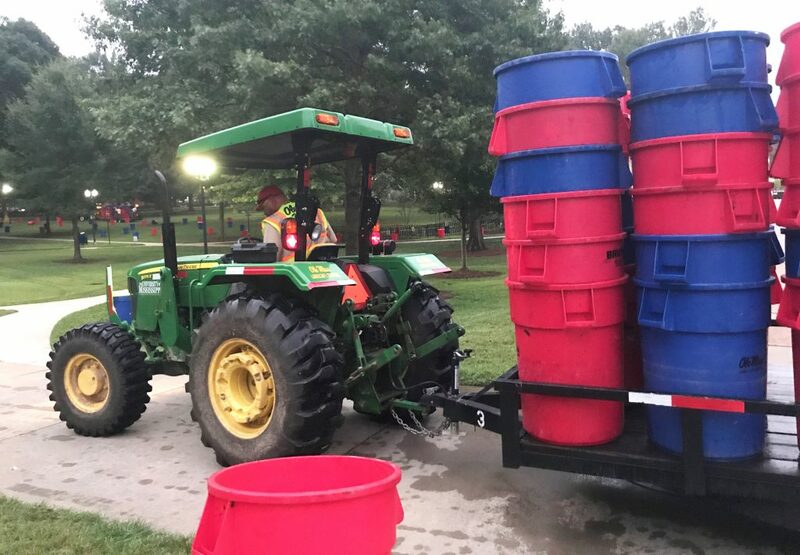 The entire field staff of 25 is dispersed around campus — collecting trash, fertilizing flower beds and disseminating the Dixie Cups. The process of spreading the Dixie Cups about campus is compelling. They are stacked 10-12 high in the back of an oversized tractor trailer before staff topple them over into smaller trailers to be broken down and placed in their weekend home. Talking while he participated in this brutish yet charming process, self-proclaimed “All-Star” Neil McIntosh cannot help but smile. Under his dark blue sunglasses sit a pair of eyes that have seen everything on campus, from possums and raccoons to a student asleep in the nook of a tree. McIntosh is the longest tenured member of staff, having worked in the department for 31 years. Everybody seems to have a story about McIntosh. When his name is mentioned, all the staff members light up, beaming with admiration for their colleague. McIntosh was unaffected. It’s just how he is. As dawn waned and there were but a few trash cans left to be set, the finished product came into view. Examining the collective masterpiece, senior groundskeeper Kenny Walls stood silently away from the rest of his staff. Walls is a burly man with faded tattoos lining his forearms and a firm handshake to accompany them. For most of the morning Walls was elusive, commandeering the trailers behind his John Deere and assisting where he was needed. But when the work was nearly finished, he opened up. “When I first started here, I wouldn’t have talked to (a reporter). Jeff, through his leader-to-leader meetings, has helped me out a whole lot,” Walls said. Walls embodies the vision McManus laid out 18 years ago, when he, too, started with the grounds team. He has bought in earnestly and, as a result, has seen his life and work transformed in the process.